Today,the United States of America has imposed sanctions on six individuals accused of fueling violence in war-torn Somalia. Reports say Col. Tewolde Negash and Col. Taeme Goitom were listed to US sanctions list, along with Suhayl Salim Muhammad Abd-el-Rahman, Abubaker Shariff Ahmed, Omar Awadh Omar and Aboud Rogo Mohammed. All are alleged supporters of the al-Shabaab militant group in Somalia. In addition, Negash, an intelligence officer of Eritrea, the principal architect of the government of Eritrea’s relationship with al-Shabaab in Mogadishu in 2006 is also accused of funneling money to other anti-Government groups in Somalia as well. A Somali woman and child at a relief center in Dollow on the SomaliaEthiopia border. U.S. Permanent Representative to the United Nations Ambassador Susan E. Rice states that the six individuals are allegedly threatening peace in Somalia. At DC, Ms. Rice states that these individuals all have links to the terrorist organization al-Shabaab, which remains one of the greatest obstacles to restoring stability in Somalia. She cites that the sanctioning of two Eritrean military officials underscores the ongoing concern about Eritrea’s violations of Security Council resolutions. She stresses that the United States condemns, in the strongest terms, all acts that further destabilize Somalia and bring harm to innocent civilians. In May this year, with famine conditions no longer present in Somalia, the UN Deputy Emergency Relief Coordinator Catherine Bragg underscored that humanitarian situation remains critical as 2.5 million people are still in crisis. Ms. Bragg has urge the international community to build on the effective delivery of aid that helped roll back last year’s famine in Somalia. The number of people who need food aid decreased by 1.5 million, but 2.5 million people are still in crisis and that is a very large number, Ms. Bragg stressed. The UN is strengthening coordination with key actors, including Turkey and the Organization of the Islamic Conference, which is vital to ensure that all of resources are used efficiently for the benefit of the Somali people, Ms. Bragg said. Last year’s drought made some 3.8 million Kenyans dependent on food aid and an estimated 2.2 million people remain in need of assistance, including 250,000 who are in humanitarian crisis. On July 2011, the United Nations Children’s Fund (UNICEF) said airlifted emergency nutrition supplies and water equipment into Somalia, the country worst affected by a severe drought that has ravaged large swaths of the Horn of Africa, leaving an estimated 11 million people in need of humanitarian assistance. On 24th of October 2011, US Secretary of State Secretary Clinton also announced an additional $100 million, primarily in food assistance, for drought-affected populations in Ethiopia, Kenya, and Somalia. With this announcement, the United States Government, the largest humanitarian donor to the region, is providing over $750 million to meet ongoing and urgent humanitarian needs, including approximately $175 million in humanitarian assistance for Somalia. More than 13.3 million people are in need of emergency assistance in the Horn of Africa, primarily in Ethiopia, Kenya, and Somalia. The United States is deeply concerned by the humanitarian emergency in the Horn of Africa, the famine that is occurring in parts of Somalia, the ongoing conflict and political instability within Somalia, and the escalating refugee crisis across the region. The United States is the largest donor of humanitarian assistance to the region, now providing over $750 million in life-saving assistance to those in need. This assistance has reached nearly 4.6 million people, many of whom would otherwise have died from starvation or related diseases. The United States remains committed to breaking the cycle of hunger and famine in the Horn of Africa and to this end will continue to provide humanitarian assistance to those in need and call on others to join it in supporting the UN’s $1.5 billion 2012 Consolidated Appeal for Somalia. Somalia has been in constant wars for past two past decades since the collapse of the Somali state in January 21, 1991. Millions of lives were lost and countless number of people had been internally displaced. 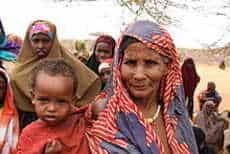 Somalia is the country worst affected by a severe drought that has ravaged large swaths of the Horn of Africa, leaving an estimated 11 million people in need of humanitarian assistance.